Sitka Community Hospital and the Sitka Public Library are joining forces to make a short safety talk about the hospital’s new “Be Bright At Night” campaign. The presentation takes place from 6:30-7 p.m. on Thursday, Oct. 29, at the library (located on the Sheldon Jackson campus). Multiple door prizes will be raffled and given including lighted reflective bands, vests, iron-on reflective tape, helmet stickers, and two high-visibility jackets. For more information, call Sitka Community Hospital Director of Health Promotion Doug Osborne at 747-0373. Pedestrians — including people who travel by foot, wheelchair, stroller, or similar means — and cyclists are among the most vulnerable users of the road. According to the Centers for Disease Control and Prevention, in the next 24 hours, on average, 445 people in the United States will be treated in an emergency department for traffic-related pedestrian injuries. In 2012 alone, 76,000 walkers were injured in the United States. 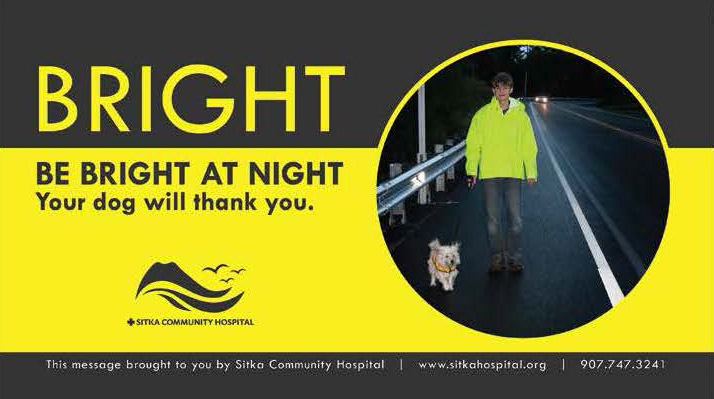 Now that we’re into the darker season with more inclement weather, this is why the Sitka Community Hospital is launching its “Be Bright At Night” biking and walking safety campaign. 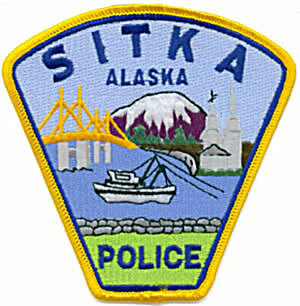 Sitka can be dark especially in winter and many of the bicycle and pedestrian fatalities happen in low visibility. Drivers can only stop or swerve for the people they see so having lights, reflectors and high visibility coats provides a great protective factor. Thanks for funds from Wells Fargo Bank and the State of Alaska Injury Prevention Program, the Sitka Community Hospital Health Promotion Program will be raffling off high visibility coats at various locations throughout Sitka. People usually refer to injuries from collisions with cars as “accidents,” however they are preventable. The baseline data showed just 3 percent of walkers and bicyclists in Sitka were visible to motorists in dark conditions from about 150 feet. 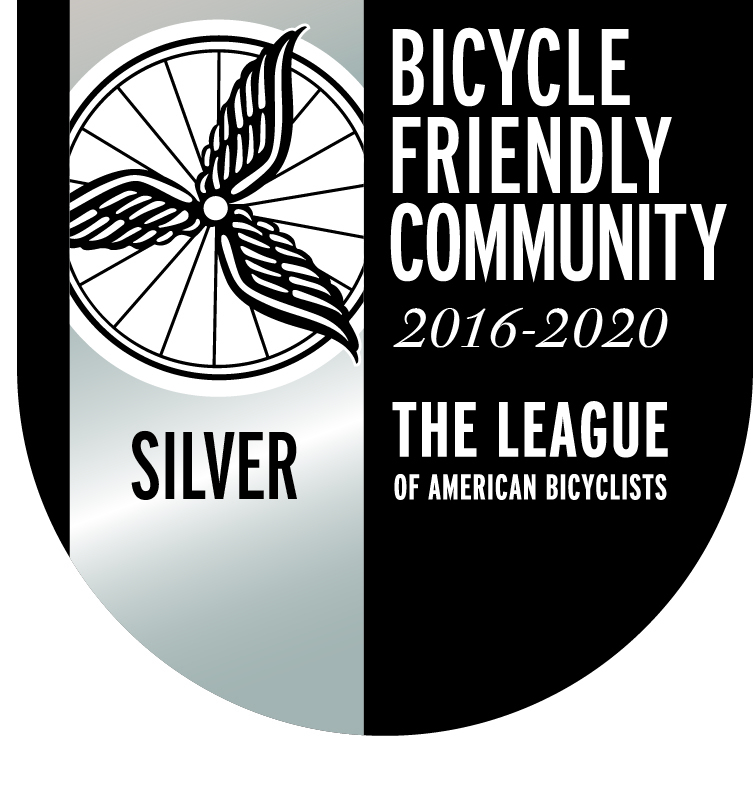 The hospital is committed to bringing that number up, especially in light of the fact that Sitka’s walk and bike commuting rates are significantly higher than the national average. Having a coat that covers your whole upper body and can be seen from all sides is one way to be visible and safe as you walk the family dog, bike home from work or go for a walk anywhere near cars. 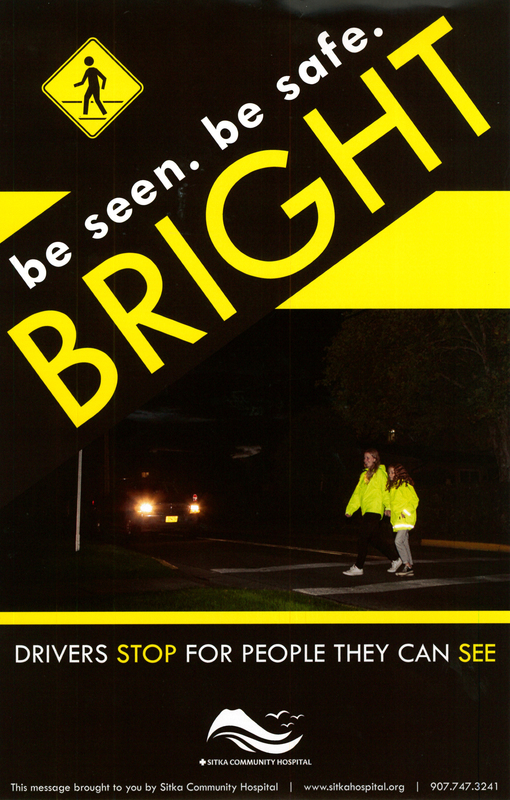 For more information the “Be Bright At Night” campaign, contact Sitka Community Hospital’s Director of Health Promotion Doug Osborne at 747-0373. Sitka residents decided to find ways to honor and support our elders, build an accessible community playground near Crescent Harbor, and build a community greenhouse on the roof of the city cold storage building (or a similar-flat-roofed structure), choosing those as the three community wellness projects Sitka residents chose to pursue in 2015-16 at the ninth annual Sitka Health Summit planning day Friday, Oct. 9, at the University of Alaska Southeast Sitka Campus. These three projects (one broad topic, and two specific topic projects that tied as top vote-getters) each were awarded with $2,000 in Tier 1 seed money to help get them started. 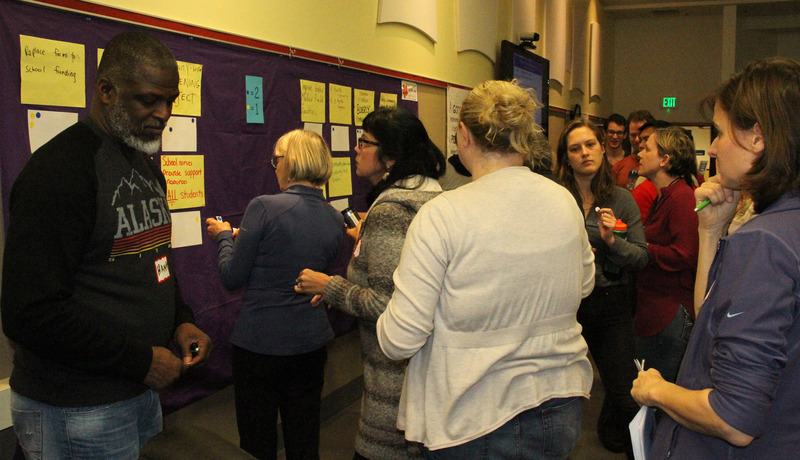 The three projects were picked after 57 Sitka residents brainstormed and discussed the advantages and disadvantages of a wide variety of community wellness projects. In addition to the Tier 1 awards, the Sitka Health Summit also made applications available for Tier 2 grants of $10,000 for projects dealing with nutrition (applications are due Oct. 23, contact Lauren Hughey at lauren.hughey@searhc.org or go to http://www.sitkahealthsummitak.org/ for more information). The Sitka Health Summit also honored Lynne Brandon with a lifetime achievement award for her work promoting healthy lifestyles during her 13 years as Sitka’s Director of Parks and Recreation and now in her new position as executive director of Sitka Trail Works Inc.
Each of the three Tier 1 projects will host a kick-off event in the near future, and these events are open to the public and anybody who wants to help with the project. More information about the projects, their kick-off meetings, and contact people are listed below. Design and build an ADA-accessible Sitka Community Playground, 6 p.m., Monday, Oct. 26, Sitka Community Hospital classroom, contact Kealoha Harmon, 747-3500 — This project is to create an accessible, attractive, low maintenance and safe community playground that will meet the needs of both children and their families. Right now Sitka does not have any playgrounds that are compliant with the Americans with Disability Act. Building the community playground was selected as a Sitka Health Summit goal in 2011, and a lot of important work has been done. Now it’s time to move this community-supported project forward. Build a Sitka Community Greenhouse on the roof of the city cold storage plant (or similar flat-roofed building), 6 p.m., Wednesday, Oct. 28, Sitka Pioneer’s Home Manager’s House (Brave Heart Volunteers building), contact Charles Bingham, 623-7660 or charleswbingham3@gmail.com — This project’s goal is to increase local food production and food security by using greenhouses, including ones situated on rooftops, a practice growing in popularity around the world. Everyone needs the nutritional boost that only vegetables provide and the more we grow locally the better. There are so many benefits to growing food here; freshness, nutritional value, sustainability and the economic benefits that come from keeping dollars in Sitka. Rooftop greenhouses also can capture waste heat and provide a flat, slug-free growing environment that will help us with food security. Rooftop greenhouses can be a point of interest for visitors, a point of learning for students, and a point of community pride for everyone who believes in innovation and using space wisely. Create a way to honor and support the well-being of elders in Sitka, 3 p.m., Friday, Nov. 6, Hames Athletic and Wellness Center, contact Caitlin Blaisdell, 747-5080 — One of the largest and fastest-growing populations in Sitka is its elders. 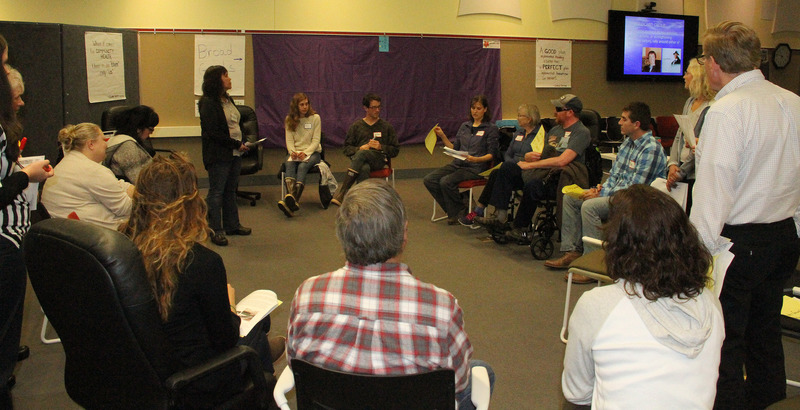 The Elder Connection action group is focused on organizing systems to support the health and well-being of seniors living is Sitka. We want everyone’s Golden Years to be just that, and we know that we can do more to support this critical group of wisdom keepers. The Sitka Health Summit is coordinated by a coalition of local groups that includes the SouthEast Alaska Regional Health Consortium (SEARHC), Sitka Community Hospital, Brave Heart Volunteers, the University of Alaska Southeast Sitka Campus, and the State of Alaska Division of Public Health Nursing, with financial help from the Federal Reserve Bank of San Francisco-Seattle Branch Community Development Division. Over the years there have been a variety of Sitka Health Summit projects — create a local market for local fish and produce, build a Sitka community greenhouse, become a Bicycle Friendly Community, become a Walk Friendly Community, encourage more kids and families to get outdoors for recreation, support a community health and wellness center (Hames), plant fruit trees around town, get more local fish into school lunches, build a Choose Respect mural, Revitalize Sitka, the Sick-a-Waste compost project, the Sitka Community Food Assessment, Park Prescriptions, Together for a Meth-Free Sitka, and Sitka Kitch (a project to create a community rental kitchen and improve Sitka’s emergency food storage capacity). 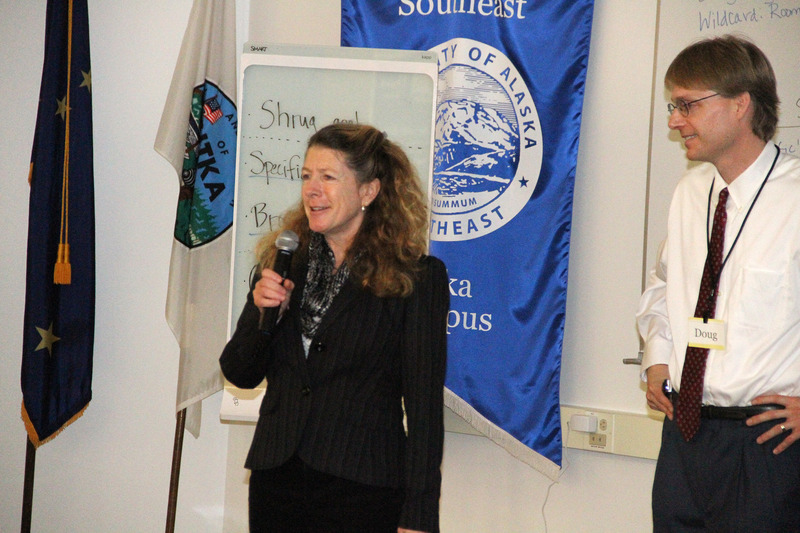 The 2014 Sitka Health Summit projects were Celebrate Katlian Street: A Vibrant Community and the Southeast Youth Resource Guide (which evolved into Family Fun Days at the Hames Athletic and Wellness Center). For more information about the Sitka Health Summit and its current and past projects, go to http://www.sitkahealthsummitak.org/. The Sitka Police Department will hold a public bicycle auction at 10 a.m. on Saturday, Oct. 10, at the Sitka Mini Storage Units, located at 310 Jarvis Street (above the U.S. Post Office on Sawmill Creek Road). The lost-and-found bicycles will be sold as is and with all sales being final. To claim a bicycle prior to the auction, you must contact the Sitka Police Department no later than 4 p.m. on Thursday, Oct. 8, with proof of ownership.